Relaxing holiday Bach in sheltered all day sunny setting. Great decor including polished wooden floors, plus only minutes to the beach, cafes, Four Square, tennis courts and play ground. Both cafes are open for dinner and children friendly. A 5 minute drive away is Waikanae outdoor swimming pool, which is open in the summer months. It is situated next to Waikanae Park in a large, sheltered and grassed area with shade structures and trees, this pool is an ideal spot for a picnic and plenty of fun in the sun. Trampoline for the kids and a BBQ. A real novelty is our hot outside shower - walk back from the beach and easily wash the kids down or relax in a hot shower after a swim without taking the sand inside. 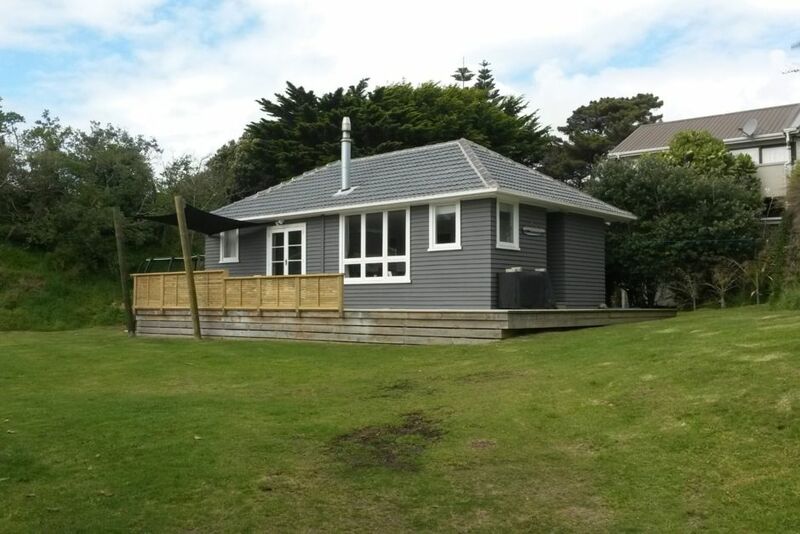 Large flat section for cricket or football or lounge on the large sun soaked deck. Woodburner to keep you toasty warm in the winter, making it an ideal place to stay all year round. Sleeps 5 (6 Max) , in two bedrooms. Please bring your own linen including duvet covers, bed top sheets, pillow cases and towels. This property may not be suitable for overseas visitors as we can't provide these items. We don’t use a cleaner in between bookings as our small bach is easy to clean. Under Kiwi bach tradition you are expected to clean the house and do the dishes (and put away) before you leave so that it is clean and tidy for the next tenants. A foul, nauseating smell in the house prevented us staying. The owner was not prepared to help. Our experience with this house appalled us. On arrival we experienced a nauseating smell which we likened to a combination of rotting wood and rats. Having arrived late in the day, we decided to stay the night and hope that ventilation would get rid of the smell. It didn’t. We rang the owner in the morning, explained the situation, and said we would have to leave. We explained that we had a midday appointment, but would leave during the afternoon. She apologised and said she would refund us. But while we were out for our appointment, and without reference to us, she asked an acquaintance to call in and report to her. She then rang us, claimed that there was no bad smell, and denied the refund. When we explained that we were with a friend who could also assess the smell, the owner told us that we were not to let any other person into the house. We did anyway, and our friend confirmed the existence and character of the smell. Arranging for an unidentified person to call in without prior notice to us, and while we were out but our possessions were still there, is appalling. Telling us not to bring anyone else into the house is ridiculous. Denying the refund she had already offered speaks for itself. We will never do business with this owner again. This is a very unfortunate and unusual situation. The previous tenants had left the same day this tenant arrived so I got in touch with them and they confirmed they had thoroughly enjoyed their stay and there was no smell. This was only a few hours before this tenant arrived. After being told that they were leaving (I was not aware they were leaving luggage in our place while attending an appointment in the area), I was so concerned about the issue, that I asked a friend’s 70 year old mother who lives in the area, to drop in to see if they could ascertain where the smell was coming from. She also confirmed that there was no smell in our house. So after having 2 independent people confirm no smell I found the tenant’s claims very strange. Still concerned, my husband and I went to our bach on Waitangi Day, but absolutely no smell was found. I thoroughly investigated the situation, but found there was no reason the tenants couldn’t stay for the duration of their stay. I’m very sorry they had this experience. Lovely stay in this old school kiwi bach. Small and simple but has everything we needed. Loved the outdoor shower and the super comfy beds. A quick stroll to beach, park and yummy food options. Awesome stay - we keep coming back to this place, it's great! We just loved our stay here, so much for the kids to do. Very tidy and lovely comfy beds. Plenty of space for the kids to run round, so close to the beach and shop plus cafes. We cannot wait to come back again. Thanks for sharing. We had a lovely time at this bach. We had a lovely time at this bach. It's small but perfect for one family. The large section is great for the kids as was the trampoline. The location is great - a very quiet road and close to everything cool (such as the bakery and beach). Thanks for letting us stay!